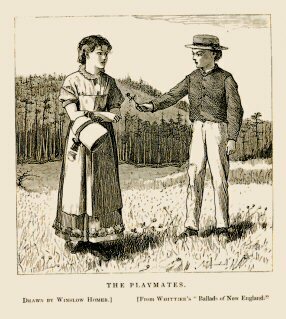 John Greenleaf Whittier’s Illustrated Ballads of New England included engravings by many artists; this sample for "The Playmates" is by Winslow Homer, already familiar to readers of Our Young Folks. With the dull days of November we begin to look more closely at our book-shelves, and ask of them, What cheer? Poetry brings the whole outward and inward world of beauty to our firesides. Happy are the fathers and mothers and brothers and sisters who can enjoy poetry together. It is by no means the “Hymns for Infants Minds,” that infants always prefer to read, although Jane Taylor did an excellent work for them when she wrote that book. But children are often on more familiar terms with Scott and Cowper, and Milton and Shakespeare, than their elders can find time to be. Mrs. Jameson tells us that she read the whole of Shakespeare when she was between seven and ten years old; and we have a little boy-friend of only three or four years whose favorite reading—on being-read-to—is Whittier’s “Snow-Bound.” We have the impression that he could recite nearly the whole poem, before he could spell out a word of it for himself. enjoy it; yet it is not this alone that takes a child’s fancy. Poetry is a whisper from the Infinite, to both old and young; and it often suggests grander meanings to the child than to those who have grown worldly-wise, and have explained everything to their own satisfaction. We venture to say that Coleridge’s “Hymn to Mont Blanc,” and Gray’s “Elegy,” and Bryant’s “Thanatopsis” and “Death of the Flowers,” and Tennyson’s “May Queen,” and Longfellow’s “Psalm of Life,” can be correctly repeated by twice as many children as grown persons,—and that at least as many under fifteen as beyond that age would be made very happy by receiving Jean Ingelow’s illustrated “Songs of Seven,” or Whittier’s new volume of “Illustrated Ballads” for a Christmas present this year. We must say a word about these “Ballads,” from which we give our readers a specimen picture this month. 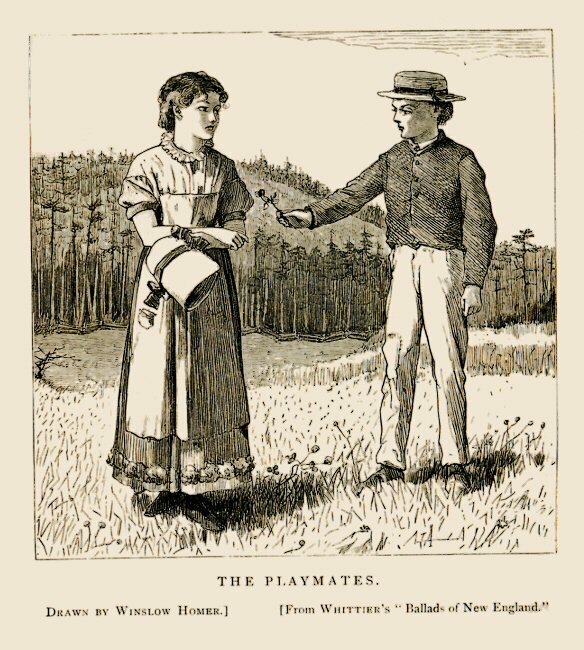 The poem it belongs to—“The Playmate”—is well known as one of Mr. Whittier’s most charming idyls. Winslow Homer has made a pretty picture of the bashful boy and his girl-playmate, who went away to the South and perhaps forgot all about him,—although we don’t believe she did. The “Illustrated Ballads” is, it can scarcely be doubted, the finest picture-book ever published in America. Mr. Fenn’s bits of landscape are perfect gems, and perfect likenesses, too, of the forest-nooks and sea-glimpses to be found all about Seabrook, and Hampton, and Amesbury. It is a pleasant region,—that through which the Merrimack broadens to blend with the Atlantic, and well deserves what it has received, the best efforts of one of our best artists to portray its beauty. Whoever looks at this book will be sure to want it for himself or for somebody else who loves pictures and poetry.